Okay everyone this is a semi sponsored review in that everything I was given was free for me to use thanks to Influenster.com whom I heart more than they know right now. For a bit of your time after you get a box you get products to use, keep and be honest about. Since I just got it yesterday I'm mostly going to show you photos of what the box contained and will do more detailed reviews later on each product. Hey everyone. I was recently contacted by someone interested in sharing some ideas about creating your very own bucket list with everyone here. I figured what they hey it would give everyone something new and interesting to look at other than my babble. And it was written by someone who is shares a few of my favorite hobbies--check her byline at the end of this piece to figure out which ones. So without further adieu here's our very first guest piece. Remember when you were younger and the carefree summers seemed to last forever? As we get older, it's far too easy to get bogged down by the responsibilities of everyday life-- our jobs, our kids, and our car payments. Now the summers seem to fly by; we forget to relax, take time for ourselves, and slow down to enjoy life. But just because you're a grownup now with grownup responsibilities doesn't mean this can't be a memorable summer you'll always cherish. Sit down, brainstorm some of those things you've always wanted to do, select the few that are actually feasible, and do them! Once you have a list created you can mark each one down as you do it. Here are a few of the things on my list and hopefully they can get you started on your own! When all your mental energy goes to the things you have to do, it can be hard to unwind in your free time. Keep in touch with yourself and your own needs by picking up an old hobby or finding a new one. Join a runner's club to get back in shape and make some new friends. If you enjoy the outdoors, find local hiking trails or start gardening. MIT offers free access to materials for many of its courses on its website now; you might try learning the basics of a new field. Find something that you like and jump into it! Having a hobby is a great way to spend some free time and also a great outlet for energy and creativity. Maybe you were on the varsity sports team in high school. Maybe you used your bike to get around everywhere in college. Maybe you used to go on distance runs in your city's greenbelt. Remember how good it felt to go on a run back when you were in shape? If you've gotten out of the routine, it can be hard to get started again, but now's the time to get back in shape. You'll be glad you did. Keep your eyes on the reward: that exhilarating feeling of meeting a new workout goal, the rush of endorphins, and, of course, having a better body and feeling healthy. To stay motivated, recruit a friend or family member to exercise with you-- working out can be a great way to strengthen your bond as well! Use this summer to get your fitness train rolling and by fall you won’t be able to go 3 days without exercising. Think about how far you have come since the beginning of the summer, then think about how far you can go before next summer starts. It’s all about setting goals for yourself and that starts now! With all of life's responsibilities, it can be easy to fill your calendar without setting aside time for yourself. Look at your day planner, find one weekend in the near future you have no commitment, and boldly write in "romantic weekend getaway" before another activity finds its way there. Research nearby resorts and reserve a room. Most modern resorts offer packages for couples that cater to both of their interests. You can lounge by the pool drinking margaritas and pamper yourself in the spa while your husband plays golf and hits the poker tables. At night you can rekindle the spark and meet up in the bar for a round of drinks and dancing. Getting away for a weekend can do wonders for your stress level and general peace of mind. With summer here now is the time to get away, YOU DESERVE IT! We form ties with hundreds of important people in a lifetime. It can be hard to set aside time for the important ones. Is there someone you used to talk to every day but nowadays only send a Christmas card to once a year? Call them up, get coffee, and catch up. There’s a saying that old friends are the best kind of friends. I believe this to be true, you might be surprised at just how easy it is to fall into your old routine when you reconnect with someone you haven’t seen in a long time. Staying in touch with people you love is one of the best ways you can invest your time. I know for me “remember whens” are some of my favorite conversations. The older we get the faster time seems to go, and no one is getting younger. I have my list on my mirror so it is one of the first things I see when I wake up in the morning. This way I am reminded of all the things I said I would do and cannot make excuses for not doing them. Take advantage of everything you can this summer. There is no reason you can’t look back on this summer the same way you do on those summer’s from what seems so long ago. I know finally right? You know I get super lazy after a relaxer because my hair is so well behaved for a while. Today was wash day and I started early for a change. My prepoo started around 9:30. 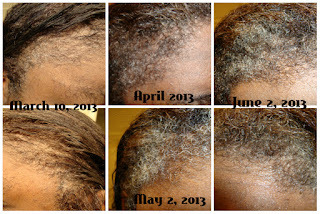 I put the Strong Roots Red Pimento Oil on my scalp and my Organix and Moroccan Oil masques on the length of my hair. The only problem with starting early is I get super lazy when I have more time on my hands. I didn't start washing until like 1:30. I took a photo of my edges too so that will be amongst the photos from today. I tried to do a better job of documenting what happened today. Wash routine went pretty easy. At only two weeks post it's hard for there to be major surprises right now. I let my hair air dry for about an hour and then put in the deep conditioner. Well not at all really and I'm sorry if you're now disappointed by my whole fake out mind control thing. Not really though cause if you think a short brown woman has the power to rearrange the world with her mind you should probably be looking for Oprah and not me. Anyhoo, I was hoping to hear from the realtor today and I did so we're going to keep pushing on the two most reasonably priced houses for now and see what our options are. She's been fantastic and I will have to give her a gift and/or recommend her to everyone looking for a place to live. Then I found out through my normal blog hopping that I won a giveaway that Lauren at Filing Jointly and Lauren of Origami Owl hosted a few weeks ago. I went exploring on the site and think I have found an adorable collection of charms and things to put together. I may have to pay a little extra but that's because I'm including everyone in my family in the piece (mom, dad, brother, sis in law and nieces plus me of course). It may depend on how big the charm needs to be in order to hold all of those smaller charms. Totally rocks to win stuff unexpectedly especially when it's so pretty. Part of my brain is saying but what if you get married and have babies? Well I guess I can make one for that new family too. But right now my family is pretty set. Boo hiss looks like the Heat won another championship but as the NBA is fading in my line of sight more and more each year I guess it really doesn't matter. Hair updates coming this weekend when I stop being lazy and wash it instead of just moisturizing it. Do you ever feel “stuck” or like you’re going through life as some kind of pseudo version of yourself? Are you ready to realize your greater potential - and live like a princess in your very own fairy tale? In this engaging, easy-to-read book, intuitive healer and spiritual mentor, Morgan McKean, takes you through a journey of self-discovery, so that you can create your life the way you want it to be. Each chapter represents a personal strategy session that can be used alone, or in conjunction with the other chapters, as a way to expand your mind, while setting the mental and emotional foundation for creating your happily ever after. Covering topics like Fun, Food, Fitness, Men, Money, and Meaning, Morgan shares her spiritual insights and real world techniques for making you the princess of your very own fairytale, called LIFE. Because there's a little part in each of us that wants to Become Princess Charming, Morgan is offering you this unique opportunity to create your very own fairytale. The book was written by Morgan McKean (click here for more details) and even though it's around 300 pages it's a relatively quick read, I covered it during an insomnia fit one night, that provides you with a variety of things in each chapter. It focuses on women she's already worked with by giving you examples of how some of us arrive in our stuck state with each of the categories, explores how to make our view of the world more productive for us as well as encourages exploration of what it would take to get there for you. A lot of the book's focus is really about changing how we see the world and our potential in it. Yes the good old power of positive thinking. That's easier to achieve when we are feeling great about the world but this gets into trying to do it when things aren't working as well as we would like and how to move beyond that. Some sections worked better for me than others, namely food, fun and money. I have an awkward relationship with food sometimes. I rarely eat to excess but when I do it's normally because I'm stressed or disappointed and that just starts a nasty cycle until I break through it. And I have known for quite sometime that I have blocked my own avenues to have fun because of fear about the expense of the things that I really like to do. Even though a flight to Vegas to catch a Prince show wouldn't have broken the bank. The timing of it, near Christmas, in my brain meant I would be short changing relatives for gifts and the timing of our checks being off said no nice lady you have responsibilities. And I do but all that's meant is me being frustrated because the people I'm responsible for don't seem to cut back on what they see as fun to help me out if that makes sense. Which leads to me being resentful and continuing the stuckness. My money and fun are linked together too but the other aspect of that is investing in myself to potentially make more income so the fun things aren't distant ideas and can come to fruition easier. All of that is not to say the fitness, men and meaning sections are not relevant they just weren't as applicable to where I am stuck at the moment. I enjoyed the exercises at the end of each chapter but my therapist brain, since that's what I do for a living till I start my new job ha, wanted a bit more of them--possibly a section to revisit after you made the changes to compare how you thought it would look and what it actually manifested itself as in your life. I like exercises as they get your mind in the thought process it needs to approach in order to see if something can actually be different. Many of you know I'm in the process of house hunting long distance and have been frustrated repeatedly by people not getting back to me and getting moved before the job officially starts so I can at least be unpacked. It was driving me nuts and ratcheting up my contacts wasn't doing much to make a dent in getting help. Well this will seem unrelated but as part of the moving I've been storing the DVDs in a large storage case so we weren't packing all of these cases that at this stage no one really needs and take up a ton more room than a case that can hold 320 dvds. After hunting online I found out that Best Buy had one on sale and appeared to still have some in stock at a local store. I ran out to get it among other things for the nice lady that lives with me and drives me slightly crazy, known as mom, and was quite frustrated when no one in the store could find it and figured it would just add to the craptastic luck I've had with realtors as I had called one that morning and hadn't heard a thing at by noon when I left for the store. I was almost out of the store when I said let's just try to make this trip not wasted if possible. The Geek Squad guy was able to order it for me and get it shipped to my house for free. He rang it up and to my amazement the total price was less than what I had seen online when I left home. Well that's because the store had marked it down 5 bucks less than the online price and that's what I paid. I figured if nothing else that was a win for the day and I was going to believe that my luck would change with the housing front soon. When I got back home after errands, a house I saw last week was marked down 15K so I said screw it and put in a contact request with the realtor. I hadn't heard from her by the close of business but they were an hour ahead of me so a morning call would be fine. Nope she called mid pizza preparation and asked me what I was looking for, what I would be willing to pay, deadlines and preferences and unlike her counterparts didn't seem freaked out by me being out of state and trying to relocate. She told me she'd be in touch soon and I hung up feeling fantastic. I ate my pizza, got cranky with the Voice results and went to bed on time for the first time in a long time because I wasn't as stressed about this house hunting thing and started to put more positive energy out there that all would come to fruition. Turns out after I went to bed she sent me like 20 houses that mostly hit on all of our discussion that I showed to mom the next day and we agreed on about 5 to look further into. I'm not saying that the results would have been different if my brain hadn't switched over to this can and will happen because I want and need it do. The fact that they were different and that I quit thinking this person isn't going to call me back could totally be a coincidence but as a lifelong pessimist to my exes, realist to me lol, it felt better to not be in a negative head space about my goals. That's a really dumbed down synopsis of what I felt the book was about but really the book makes an overall good point. How can you be your own princess if you don't believe in your fairy tale? If you discount, dissuade, dismiss all of the things you want in your life best believe they probably won't happen for no other reason than your energy won't allow them to do so. If you are intrigued go ahead and head over to Morgan's SITE and you can purchase the book, sign up for other services and learn how to host a Princess Party for us big girls if you are so inclined. For you new era princess in training you'll be thrilled to see the book in kindle format. For an older era princess to be like myself I did miss flipping through physical pages but I totally recognize I'm a bit of throwback in that regard. I do still love a good bookstore and library--ahh book smell lol. Final thoughts, if you are stuck in area and don't know why or how to get unstuck I think this can be a great tool to help you along provided you are willing to learn how to refocus your thinking to make the changes you want in your life. I think it would be great in a therapy setting if I just remembered to print off the pages in time which yeah can be a problem sometimes ha. Okay enough of my babbling, I'll be back later with another post. Question :: What inspired you to write Becoming Princess Charming? McKean :: Well, after a couple of false starts in my twenties, and a lot of resistance to writing anything longer than a blog post or magazine article in my early thirties, last Summer, as I was contemplating how I could best share my spiritual ideas for fabulous living, as I believe that when we understand how magnificent we really are, we can create our life the way we want it to be, I received over eight requests, and two demands, from clients and friends, in less than a two week period, to write a book. Then, as I finally sat down to write, and the book was essentially pouring out of me, I began to see that I was finally at a place in my own life, where I could allow myself to be the catalyst or messenger to deliver these ideas. And, when the book was completed in less than fourteen weeks, having very little to do with me personally, I really got the message, it was time. Question :: What can people expect from this six-session guidebook? McKean :: I believe that living the life of “Princess Charming,” is first about learning to love and accept yourself, and then, being able to create your fairy tale, or life, the way you want it to be. Accordingly, I’ve broken this guidebook down into six sessions, including; fun, food, and fitness, and men, money, and meaning, so that you can see who you are being in each of these areas of your life. In each “session” with me, you’ll go on a trip of self-discovery as you learn more about your fear-based ideas and thinking, and develop the ability to identify old programing and limited beliefs that are currently holding you back from living your life the way you want to be. Additionally, through out each chapter, and at the end of the session, you will have access to real-world exercises and new ideas that will help you shift your perspective, or expand your awareness so that you can create your happily ever after. My dedication to embarking on this journey of self-discovery and spirituality, as well as doing the work daily, has transformed every area of my life for the better. I’ve learned to have more compassion, love, understanding, and appreciation for who I am, what I’m capable of, and how what I really believe about myself and the world around me influences how I experience our physical reality. Is There A Limit to Inclusion? This will probably come out of nowhere for some of you but another conversation about a startup sorority led to a discussion about one of their membership requirements. Must be a natural born heterosexual woman who is 18 years or older. Now some of you may remember that I'm in a sorority myself and that's partly why this particular requirement stuck out for me. My sorority doesn't require that you be heterosexual or even 18 really because we know some smart cookies get to college early and can join as long as they have the other requirements in place. However, the natural born woman piece hit a lot of chords in the conversation we were having. One because of the number of homosexual men who have decided they want to be members of my or other sororities and have threatened to sue for that right under anti-discrimination laws. Not really worried about men getting the right to join a sorority but there's another group that has a different standing and potentially a legal in that gay men do not. Those that identify as transgendered, ie a woman in a man's body or conversely a man in a woman's body. Neither of those groups could join the organizations for the gendered groups they identify with without there being some Herculean efforts or surgery so that at their time of application it was assumed they were for all intents and purpose the correct gender. Can't say it hasn't happened already or that it won't happen in the future but without the surgery they have shakier claims than if they just pursued groups that were available to their gender of birth. In the states where it matters gender identity is a protected class so if they join and then say I'm trans they couldn't be kicked out. They may be pushed out socially but cannot be kicked out. So I have been super lazy since coming from the beauty salon. Until this morning I didn't moisturize or seal anything at all I just put on my satin cap and went to sleep. Thankfully there wasn't much in the way of tangles cause I can sleep kinda wild sometimes. If I wasn't leaving the house yesterday I wouldn't have even combed it till today and that was just to make sure I had the part where I wanted it to be. I tied down my edges after I moisturized with my Elasta QP Olive Oil and Mango Butter and then sealed with Organix Macadamia Dry styling oil. Back under the satin cap for now just to keep my ends off my shirt. I'll take a photo of my edges at some point in the next few days to show you what it looks like relaxed. And that's the other area, of course, that is full of gray since it was all new growth. How goes your stretching and/or relaxer/texlaxer days ladies? Yesterday was a good day for the most part. I went to sleep at a reasonable hour, woke up at one as well and then watched both my Serbian tennis boo and my French tennis side piece lose their semifinal matches at the French Open so I can't watch them play on Sunday and be conflicted. Instead I get to root against Rafael Nadal and that God awful digging in his crack he perpetually does as he faces David Ferrer (not to be confused with Roger Federer--those last names used to trip me up). I really hope Ferrer wins cause as I'm sure you picked up on I don't really like Rafa, he bugs the piss out of me. I'm trying to stay up for the Serena and Maria match but I went to sleep not too long after I ate dinner--I know bad--woke up for a hot second and then went back to sleep only to wake up around 2AM. The match doesn't start till 8 AM and while I'm wide awake now there's no promise of that continuing. Anyhoo let me stop rambling and get to the heart of this post. I just realized this weekend as I was prepping to wash my hair that next month I will have been on my hair journey for the last two years. While I still have some areas that need improvement, my hair has grown a lot and is MUCH thicker overall than it used to be. It feels like the ends are getting a little thin but that could be because I'm not doing the best job finding protective styles. 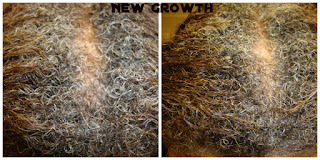 I hope to get a relaxer on Friday or Saturday and see how much hair is retained because I'm probably in need of a trim. I did take photos today though, surprise lol. My edges look much better and I have a composite shot of what has happened since they broke off in March. 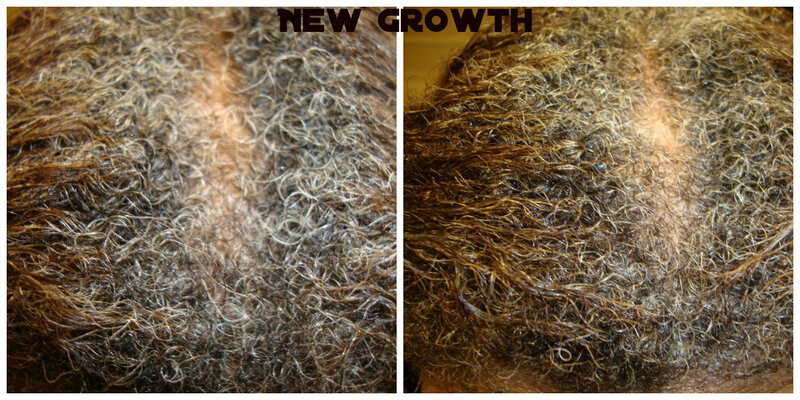 And I took a few shots of my new growth even though the gray hair seems to be obscuring the wave pattern. I did prepoo but today I wasn't feeling a post wash conditioner so I skipped that. Shed more hair in the shower than I would like but not too much during the detangling and NO matting this week so I don't have to go back through it tomorrow comb through again and reach for any knots. There were no knots this week really at all so that's a win. Just gotta get in and let the creamy crack do it's job again. After this relaxer I'll be able to see where I'm really at growth wise and be able to set better goals for the next year of my hair journey. And what I want to do with the hair color situation. Anyway here ya go. Photos. No I'm not having children and honestly nothing much is going on here because it's storming yet again. I'm VERY glad that my area has not been hit by the tornadoes but over the last three weeks or so I've been on edge every time we have prolonged storms that a clap of REALLY long thunder is really the wind build up from a tornado. My grass looks a mess but so does everyone else on the block. Prolonged rains plus not a lot of drying out time in between means healthy green quick growing lawns. Ahh well. It's time for another major in the tennis world and I'm so excited. This is the only time the insomnia works in my favor cause I'm up in time to see a lot of the matches live. Two people I don't like are playing and unfortunately one looks like she may win her match. I have no real justification to dislike Sloane Stephens OR Victoria Azarenka other than they are kind of annoying to me. Decent players, quickly beloved by the tennis world because they are so friendly and so outgoing but are just meh to me. Granted it's neither one of their faults entirely. Tennis banks on media darlings and leaves the old more reserved players in the background because they will win regardless and there's nothing to build around on them. Even though they will milk a potential story with them too. I'm very solidly Team Serena so I hope she wins even though she's done better than she did last year already so provided that Maria Sharapova goes out before she does Serena should still be number 1 in the world regardless of the win here based on WTA's yearly points thing. I have to come to respect Sharapova just like Kobe Bryant. Neither will ever be my favorite humans but they are good hustlers and have a real drive to win.